The Opulent Opossum: What Does Queen Anne’s Lace Look Like in the Fall? What Does Queen Anne’s Lace Look Like in the Fall? 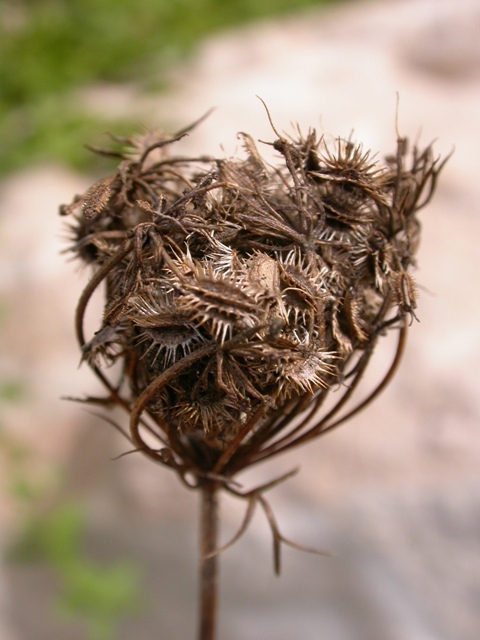 This fall, I’ve been especially enjoying the dried, curling umbels of Queen Anne’s lace, and literature has helped. 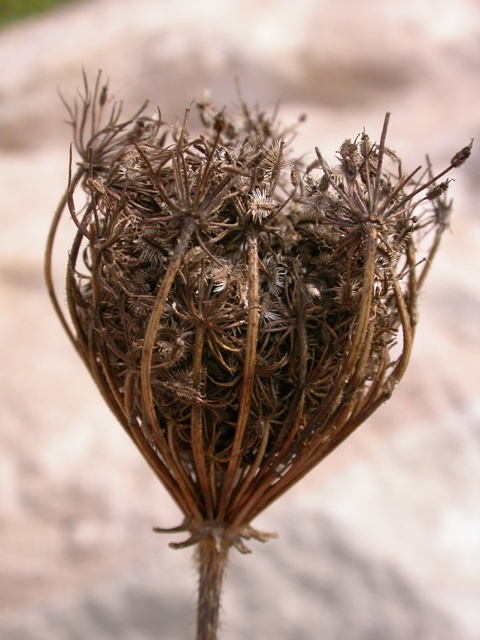 You know Queen Anne’s lace—it’s a long-ago invader from Europe that’s now a common wildflower. Also called “wild carrot,” it is indeed in the carrot-parsnip-parsley-fennel-dill-anise-celery-caraway-coriander-cumin family, the Apiaceae, which used to be called the Umbelliferae (for its type of flower cluster, called an umbel, which has the same root as our word umbrella). 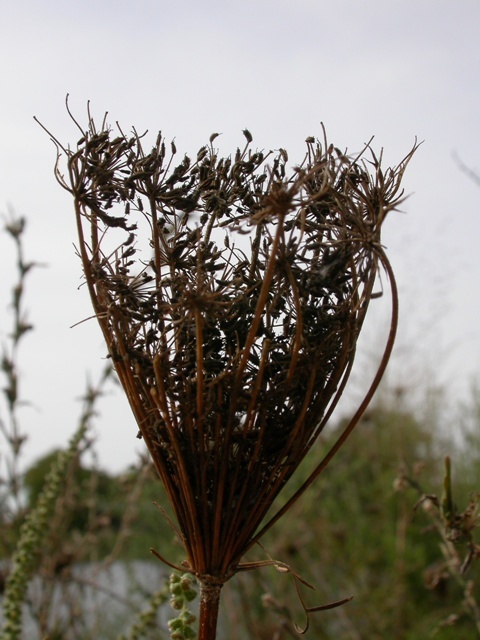 I’ve written about the Apiaceae before—remember pretty little harbinger of spring? At the beginning of the third chapter, he quite poetically describes the look of Queen Anne’s lace in the fall: “Now along that road Queen Anne’s lace was going to seed, balling up like fingers closing into a fist.” Here, and in so many places in his writings, you can tell he had studied the great poets of our language—indeed, his bachelor’s degree was in English, and he had apparently taught that subject at Friends University in Wichita, Kansas. “Balling up like fingers closing into a fist.” What a great metaphor! I think I would have characterized them as delicate little baskets full of sticktights! Perhaps it was a plaintive recurring note in the killdeer’s call. . . . Perhaps it was the faraway, lonely, nostalgic sound of the train whistle. Perhaps it was the singing of the September insects, that dry orchestral music that carries like an overtone the thought of swiftly passing life. Perhaps it was compounded of all of them—this wave of autumn sadness that enveloped me. In a day, a week, a month at most, the plovers would move on. . . . And nature—absorbed with species and averages, not with individuals—cares but little whether these birds return again. All the insects singing in the grass, all the leaves still spread to the sunshine, all the dusty annuals and the waning flowers—they were all living their last days and the end was moving swiftly toward them. Life would come again in the spring—but not this life, not to these flowers, not to these leaves, not to these crickets and grasshoppers. The book is called Inverted Fire, and the poet is Alice Friman. She was born in New York but is lucky enough to have lived in the Midwest! The volume was published in 1997 by BkMk Press of the University of Missouri–Kansas City, and I strongly recommend finding a copy for yourself. Alice Friman’s website is here. She is quite accomplished; her ninth poetry collection is being published this year. I love her poems. More than a few poems in Inverted Fire are about autumn, and naturally that reminds me of a friend of mine who died last year, who was herself a gifted, accomplished poet, and she loved autumn the best. This poem is on page 13 of Inverted Fire. It’s delicately unified in a circular pattern reminiscent of the flowering, seeding umbel itself, and the images are carefully interwoven, like the lacy patterns of the flower. 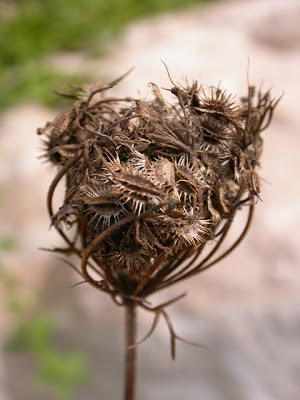 When you read it, you’ll quickly understand why I’ve been thinking so much about Queen Anne’s lace this fall, for you see I, too, was born in the autumn, and I share the poet’s view that one’s season of birth influences one’s perspective . . .
and I am walking its wards. that I too was born and gave birth. in the face of your desire?